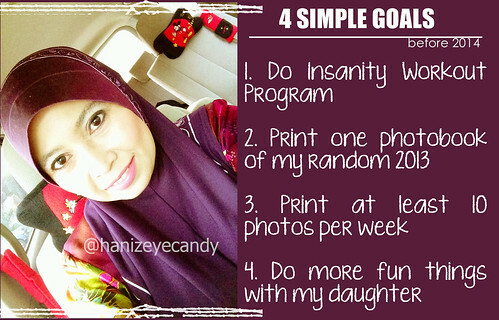 At the end of October, I shared with you my 4 Simple Goals before 2014. I have every bit of intention of checking things off my lists by the end of they year. I am glad that I put doing Insanity workout program on the lists, other wise I might not have started the program at all. I am currently on week five and six. Originally I planned to finished with this program by the end of the year but I am taking at least one week off this week because we will be on our family vacation. For my number 3 and 4 goals, comes hand in hand. I did managed to print out lots of photos and do fun project together with my daughter. We are making a smash book of our random 2013 photos. It is so much fun when you share the same interest as your daughter. Ever since I realized that my coupon codes expired on February 2014, I have been putting this project on hold. I intend to continue making the book after I get back from my vacation. I might be able to finish them at least by the first week of January and have them printed out before end of January.